Home > Gameplay, MMO, Review	> Spiral Knights: We don’t always crash land, but when we do we conquer the world! 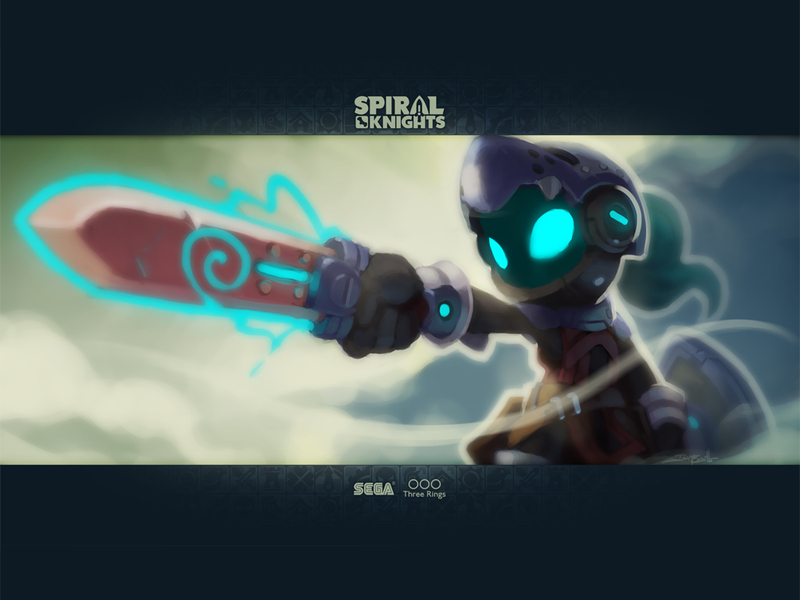 Spiral Knights is a top down MMORPG created by Sega where you take on the role of an adventurous Spiral Knight. You and the other Spiral Knights are extraterrestrials (or so I gather) who’s spaceship, the good ship Skylark crashes on a hostile planet called Cradle. Stranded with no means of escape you and the other knights must conquer the world to save yourselves. Conquering Cradle involves teaming up with other Spiral Knights in groups and heading down into the bowels of Cradle and, like Dungeons of Dredmor, the lower you go through the Clockworks the harder it gets until you are in the very core of the planet itself (with the imaginative name of “The Core”). Having been out for a few months now, Spiral Knights is not exactly brand new, but it hasn’t disappeared without a trace. Oh no siree. According to the most recent news for Spiral Knights on Steam, apparently there are over one million people who have downloaded and played Spiral Knights, and frankly who can blame them. Your Knight has at the start armour, a helmet, a shield, a sword and a gun and in classic RPG fashion you have to go around improving them. You can either buy better equipment or you can stick with whatever you have and slowly level it up using a thing called heat, which drops from boxes and enemies. It wasn’t entirely clear what amount of difference levelling up the weapons does nor was it entirely clear how much better the weapons you could buy were. Regardless it is of little importance. The gameplay is good fun and is slightly reminiscent of Alien Swarm, you drag your character around with the left mouse button and attack with the right. I’m given to understand there are more controls, but really those two are the big ones! It’s pleasingly fast paced, your character runs about quickly and get’s where you want to go in a good time. Fighting is (at the start at least) simple, and whacking your way through half a dozen robots and jellies is in no means boring. In fact I believe it is the speed of the fighting and the game which makes it so amusing. You can run around in a circle just mashing your sword or shooting your gun and it’s just good fun. The graphics are actually rather impressive and look really good. The characters, enemies and animations all look pretty cool all set on a world where the backdrops and scenery are pretty damn cool. Moreover, it’s nice to see a multiplayer where you actually have a good chance of playing with people. I tried out the first dungeon and no sooner had I selected “Look for a group” then I was snapped up and joined another 3 knights in slashing our way through the first level of the clockworks. It was quick and there wasn’t much interaction between us, but it was the first level and really it was very easy. I assume (and according to Tim I am right) it gets a lot harder as the game progresses, but somehow I can see it as always being a reasonable difficulty rather than horrendous. Who knows, that could be the most wrong thing I’ve said in a long time… but regardless of difficulty it was certainly good fun. I imagine as well that if you could get a few friends to join you in it then it would be even more amusing. Co-op multiplayers are usually fun if done well and Spiral Knights has been done very well. I think it would definitely take some time to complete the game but surprisingly I think it’s a game I can actually see myself completing. So far in all the other reviews, I haven’t been that enthused and while I’ve not disliked any of the games I have said I don’t think it likely I will ever complete them. Spiral Knights is different, I can definitely see myself, while not striving to complete it, I can definitely see me putting in a few hours when I don’t have any other games I would rather be playing and seeing how far I get. So there you have it, good fun, great looking, cool multiplayer and a reasonable difficulty level. All for the totally reasonable price of being completely bloody free! I mean genuinely I’ve seen games like this being sold on steam, things like Magicka, Atom Zombie Smasher and others cost money and yet this fantastic little MMO is completely free. I ask now… what more could you want? So if you’ve got a couple of hours to kill, why not download steam (also free by the way) and get smashing! I just checked out your review there and i like your style! We certainly need to take more screenshots in our reviews i believe. Oh and i’m not surprised, its a pretty good theme.